There are many beautiful colors outdoors in the summertime! Explore the colors with an outdoor color hunt. First, take some time to go through some crayons. The children can pick out a few of their favorite colors of crayons to bring outdoors. Take the crayons outside onto the preschool playground and let the hunt begin! 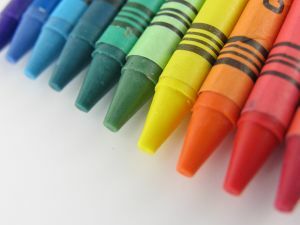 See how many objects in nature you can find that match up with the color of the crayon. This activity can also be done with ice cube trays and construction paper instead of crayons: The children place small scraps of colorful construction paper in the bottom of an ice cube tray. Then, they can pick up the items they find in nature and place them in the tray on top of the corresponding color of construction paper. To view some of our outdoor art equipment for preschools, check out our website.